Penn State trailed in the second half before pulling away. Penn State has arrived at a 4-0 record in somewhat perplexing fashion. The Nittany Lions have gotten a nice early offensive drive to start off their games but then the offense has a way of going into hibernation until after halftime. Then, it’s game on as Penn State cruises to a lopsided win (the season opener against Appalachian State is the exception to the rule). 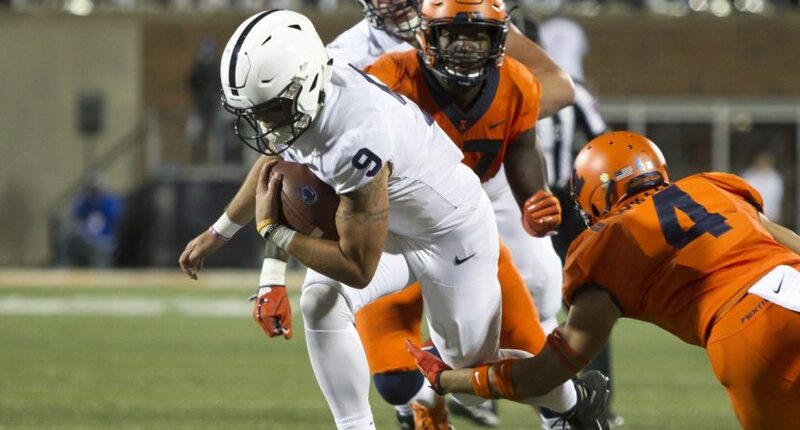 On Friday night in a Big Ten opener against Illinois on the road, the same pattern played out for Trace McSorley and Penn State as the Nittany Lions won by a score of 63-24 final score that is incredibly misleading. Illinois brought the fight to Penn State in the first half and went into halftime feeling good to only be down 21-17 at the break. The Illini then opened the second half with a bang by catching Penn State off guard on a wide receiver pass by Trenard Davis to Ricky Smalling. The early second-half touchdown gave Illinois a stunning 28-24 lead on the No. 10 Nittany Lions. Penn State’s defense was having a difficult time stopping Illinois form making this a game up until that point. But before the defense could find a way to gather themselves, it was on the offense to make something happen. Enter running back Miles Sanders, who took off for a 48-yard touchdown run just two minutes later to give Penn State a 28-24 lead. That touchdown run by Sanders would prove to be the game-winner because Penn State put the Illini in a sleeper hold that could not be broken. Illinois went three-and-out on their next possession. Penn State then marched 60 yards over 11 plays as Trace McSorley completed a 3rd and 12 pass to Juwan Johnson for a touchdown inside the red zone. Then it was the defense’s turn to make a play, as Jan Johnson made a ridiculous interception of M.J. Rivers II at the Illini 21-yard line and McSorley went for the kill with a lob to KJ Hamler in the end zone for Penn State’s second touchdown in under a minute. Penn State would continue to pile on the points and easily covered a 26 or 27-point spread when they were looking like they may have to just get out of Champaign with a gritty win at best and a miserable upset at the worst. Despite the lopsided score in their favor, this game served as a swift kick in the rear for Penn State defensive coordinator Brent Pry and head coach James Franklin. Next week, Penn State will host Ohio State in a colossal matchup of Big Ten East contenders. If Penn State’s defense plays as it did against Illinois, it’ll be a long evening for the natives in Happy Valley. Illinois rushed for 245 yards, averaging 5.4 yards per rushing attempt. The Illini may be improving with their running game under Lovie Smith (they entered the night with the nation’s 23rd-ranked rushing offense), but Ohio State has the nation’s 17th best running game with a dynamic duo of running backs in JK Dobbins and Mike Weber. On top of that, quarterback Dwayne Haskins has been on fire at the start of the season and is an even bigger threat than what Illinois brought to the table. Penn State does get an extra day to prepare for next week’s primetime showdown in front of the Whiteout crowd. While it might not be much of an advantage, it couldn’t hurt, because Penn State clearly has some work to do with its defense. Expect them to play better next week at home with the stakes as high as they will be, but Ohio State’s offense should be salivating after tonight.